Potential Reversal Setups In Two Golden Triangle Explorers | Energy and Gold Ltd.
Shares of Aben Resources (TSX-V:ABN) have slid lower along with other Golden Triangle explorers in recent weeks. The delays in receiving assays back from the labs hasn’t helped the situation either; investors tend to sell first and ask questions later when they perceive that a company’s drilling results are being released later than expected. Just a few weeks ago expectations for many of the Golden Triangles names such as Aben, Golden Ridge, and GT Gold were through the roof. Now it seems as if the market pendulum has swung the other way and the lab delays are being interpreted as being a sign that these companies don’t have anything noteworthy to announce to the market. However, from a trading standpoint it’s usually a much better idea to buy shares of stocks with lower market expectations as opposed to situations in which expectations might be overly-inflated. 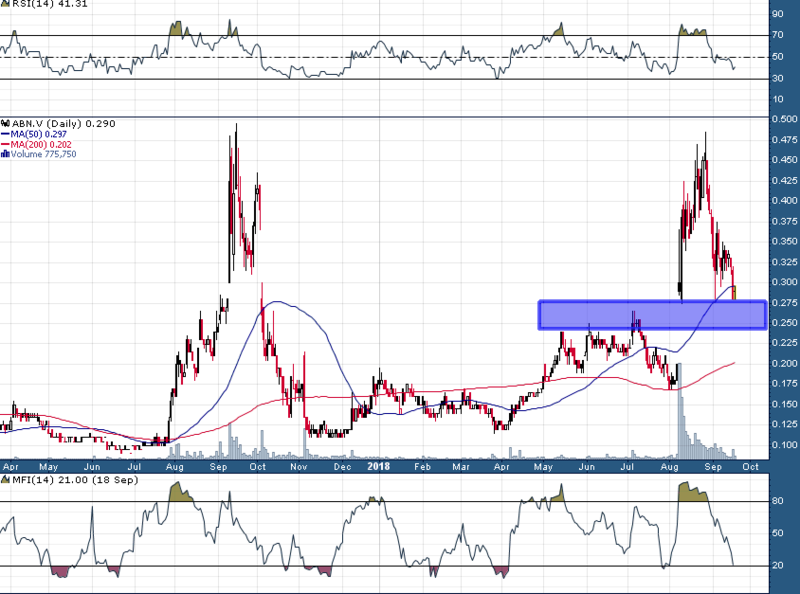 The chart setups in both Aben and Golden Ridge (TSX-V:GLDN) appear to be attractive from a risk/reward standpoint. 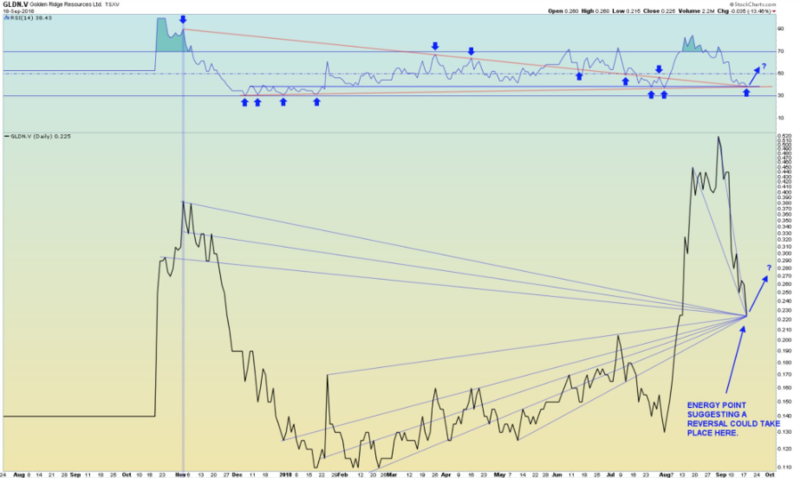 Important support/resistance zone between C$.24 and C$.28. However, ABN still remains in a year-to-date uptrend with rising 50-day and 200-day moving averages (the slope of moving averages are more important than specific price levels). Two of Ty’s recent energy point charts have worked extremely well (NVO.V and GDX) and I have a feeling that at least one of these will prove to be prescient. Disclosure: Author owns shares of ABN.V and GLDN.V at the time of publishing this post and may buy or sell at any time without notice. The article is for informational purposes only and is neither a solicitation for the purchase of securities nor an offer of securities. Readers of the article are expressly cautioned to seek the advice of a registered investment advisor and other professional advisors, as applicable, regarding the appropriateness of investing in any securities or any investment strategies, including those discussed above. Aben Resources Ltd. is a high-risk venture stock and not suitable for most investors. Consult Aben Resources Ltd’s SEDAR profile for important risk disclosures. EnergyandGold has been compensated to cover Aben Resources Ltd. and so some information may be biased. EnergyandGold.com, EnergyandGold Publishing LTD, its writers and principals are not registered investment advisors and advice you to do your own due diligence with a licensed investment advisor prior to making any investment decisions.